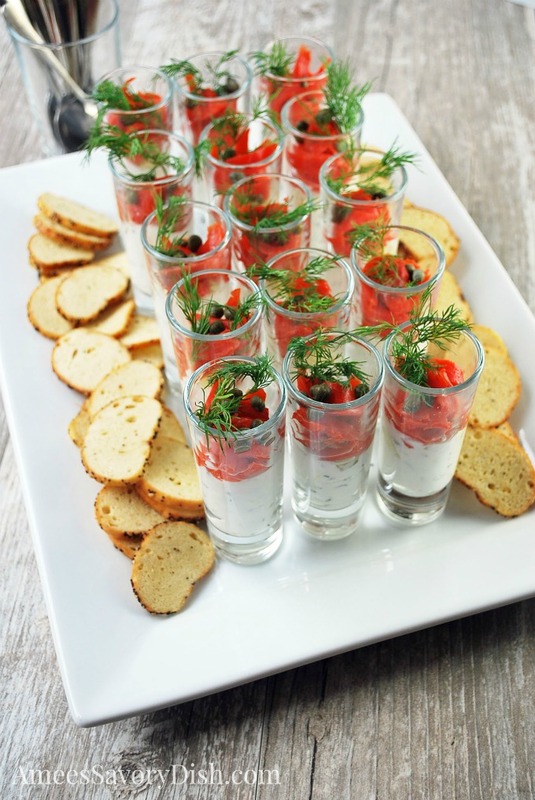 I was served a memorable snack at Blog Brûlée last month that inspired today’s recipe for Smoked Salmon Shooters. It was Cured Salmon with Skyr served in small mason jars presented by Siggi’s Dairy. It was scrumptious! This week’s Sunday Supper theme is all about making your holiday entertaining a breeze with easy holiday recipes. These gorgeous little appetizers are impressive to serve, but very simple to throw together. Ya’ll know I’m all about healthy and easy! Smoked salmon is one of my all-time favorite appetizer ingredients. It’s full of flavor, loaded with heart-healthy fats and muscle-building protein and adds beautiful color to a dish. 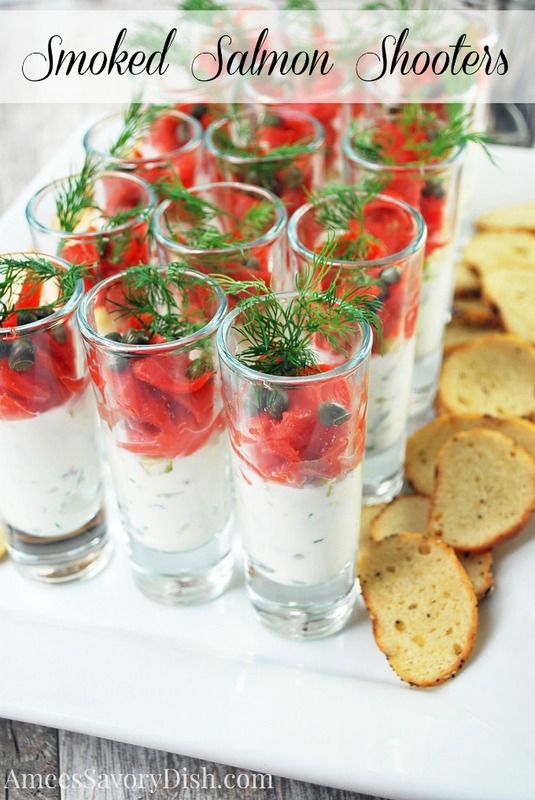 Another favorite yogurt & salmon appetizer on the blog are these Yogurt & Chive Potato Rounds with Smoked Salmon & Capers. They would also make a nice addition to your holiday spread. 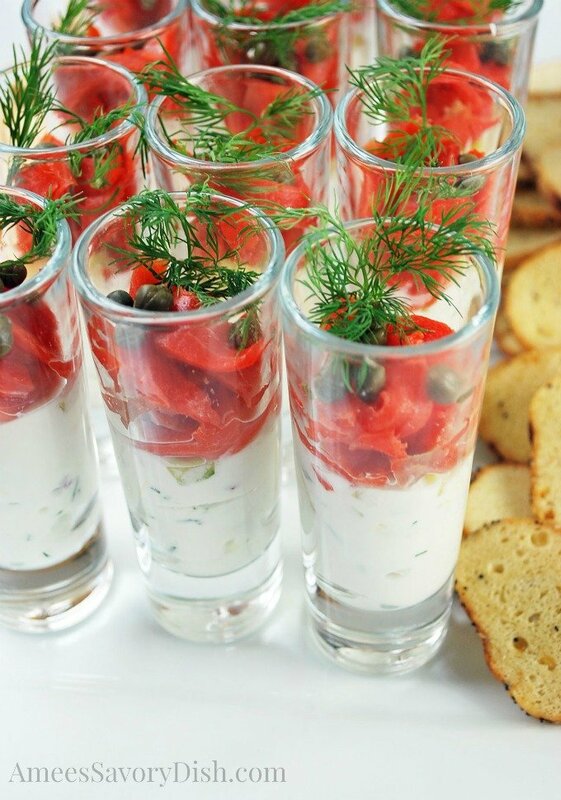 Serve these smoked salmon shooters with bagel chips or toasted pumpernickel bread slices. Make sure you have spoons handy so your guests can just scoop them out and spread on top. You can also enjoy these as a gluten-free appetizer and eat them without the bread and chips. They are amazing all on their own. I don’t know about you, but I’m ready for a party! Don’t miss out on all of these other holiday party hits from my Sunday Supper friends below! What is your favorite holiday entertaining recipe? I am always looking for new ways to serve smoked salmon and this is genius!!! SO beautiful, Amee!!! What beautiful presentation! The combination of flavours sounds so delicious! Thank you Jennifer! Back at ya! Thank you so much EA! That is a gorgeous presentation!! I love smoked salmon too!